Wednesday, August 1st, Blog by Heidi Stecher. We had an amazing third clinic, seeing about 100 patients. The team worked cohesively and efficiently. We had reset the stations as they were the day before. We saw another village but in the same spot. I was impressed with Lesbia, the health care worker who does all the charlas. The charlas are different talks such as on gastritis, headache/back pain, colds, and GI viruses. Lesbia saw many people at a time teaching patients about these subjects and how to care for themselves. It is the presence and work of the local trainers, promodores, that make a huge difference in the education and understanding that allow for lifestyle changes to be made. They already have a rapport and built in trust since they are from the villages. This work is priceless and incredibly meaningful to the people they serve. It is my belief that this is where the focus ought to be when outside organizations come in to serve. 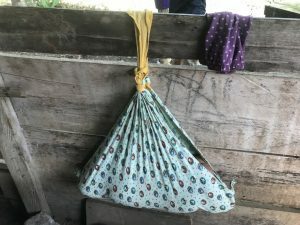 It is very brief and has a “band aid” effect when people come and go, but when there is a villager who is the health care worker who can help maintain and continue the education, this is where change can happen. There were seven of us that decided to walk an hour from the village to where our bus had broken down. We were so impressed with the beautiful landscape and wanted to spend more time in it. Along the side of the road we found a mama pig with her seven piglets, plants with leaves that curl in when touched, and smiling children playing. The time went fast talking with my colleagues learning about where people worked and plans for their future. I think times like this with smaller groups within the large group lends itself to better communication and understanding. It was a walk to remember. Tuesday July 31, Blog by Heidi Stecher. We took our bus carrying at least 25 people and supplies to Chinachabilchoch. This is a very remote village straight up a mountain with precarious turns and drop-offs. But the view from the bus was spectacular, emerald green hills and mountains softened the landscape with its curves. Such tremendous beauty with luscious over growing plants and trees. This came to an abrupt stop after the bus we were traveling in could not move its back tires up a hill. We all plopped out of the bus with half of us taking the truck to start triaging patients while the rest had to hike up the mountain an hour and a half trek. Thankfully, I was in the truck group, but once we arrived we scurried to put our stations together and formatted lab, vitals, triage, provider, pharmacy and charla (teaching) stations. We saw about 40 people that day. The villagers stayed around us, watching inquisitively, smiling. Some children would burst out laughing, but when catching their eye they would look serious. I noticed the beauty of the people, to intricate fabricates women wore for their skirts with lace-like tops. Many had babies or children hanging on them. That night we played scattergories and had a delicious meal of tamales, beans and rice outdoors in the village’s center. Ron and I debriefed with everyone and reflected on how it has been going so far, what they had learned, what they have been processing on the trip. I think this was a point that brought us closer sharing our thoughts and feelings about our experiences. We spent the night up in the village in our sleep sacks under mosquito nets in the school. This was an adventure, from a reclined position we had a hilarious time, spending the first hour in our sleep sacks laughing at and with each other. During the night so many sounds affected our sleep from snoring, to the sound of large pig being slaughtered, to gentle, creeping children’s footsteps on the grass outside the open air window to numerous crickets chirping their song. Monday, July 30th, Blog by Heidi Stecher. Our first official clinic day was spent in the town of Esperanza Tunico. We saw about 60 patients. We, unfortunately, had a sick colleague that needed immediate help in the clinic. This threw many for a loop as some left their stations to assist her and getting her IV fluids and nausea medication. It was stressful for those taking care of her, and the rest of us plugged along in the sweltering heat and humidity. I can’t remember the last time I had been drenched from head to toe and continued that way all day. I realized that this is what it will be like for the next week before heading back to Guatemala City. So, I told myself not to expect the moon, and I can only do my best according to what the environment provides, as the weather itself is debilitating to the mind and body. The weather affected my ability to think quickly and I was slow in my movements. This reminded me to drink more and include electrolytes. The clinic itself was busy, we were exhausted. There was confusion with who was next after vital signs. So, I knew we needed to get that ironed out before the next clinic. I worked in triage and we saw many with complaints of body aches, gastritis, cough, skin issues like scabies, some wounds and also pregnant mothers and children. One woman had to give a urine sample, so I offered to hold her baby. The babies are swaddled with a large blanket triangled and twisted at the top. They hold babies from the twisted top and swing them. Elma, our lab tech, said she doesn’t hold the babies because she is not used to holding them that way. I tried and swung the baby, but I felt uncomfortable, so brought the baby up to my arms and held him. Sunday, July 29th, Blog by Heidi Stecher. Today we traveled east about 8 hours from Guatemala City to Lake Izabal in an old yellow school bus. From what I heard is that the yellow buses found in Guatemala are from the United States, ones that didn’t work very well. Oh geez! But I am sure the Guatemalans are resourceful when they break down or maybe most people are more mechanically inclined than most Westerners who bring their vehicles to get serviced instead of fixing it themselves. 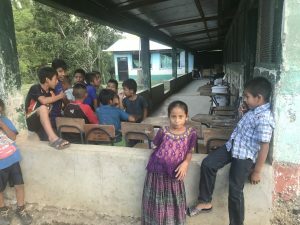 Saturday, July 28th, Blog By Heidi Stecher, Guatemala: Health Services Delivery in Resource- Poor Settings Program. Today we are in Guatemala City, our first full day here. 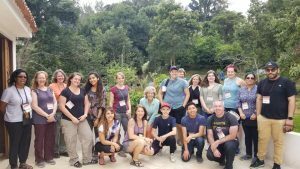 We traveled to Dr. Jennifer Hoock’s home, in Santiago, about an hour bus ride from our hotel, Barcelo in Guatemala City. (Barcelo is a higher end hotel, which I was pleasantly surprised to experience). 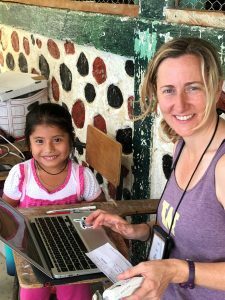 Dr. Jennifer’s home is the main outpost for Guatemala Village Health. This is where she has trainings for local Guatemalans and volunteers from the United States. Aldeas Sanas is the partner organization of GVH. Samwel, our driver and English-Spanish interpreter is the director of Aldeas Sanas. He is the man on the ground in Guatemala for GVH. Surrounding the training center outside are stations where GVH teaches and trains people on better living practices. 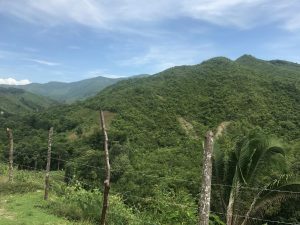 The stations include a permaculture garden, a carpentry studio, a safer housing structure for villagers and a latrine utilizing sawdust for cleaner sanitation. After being introduced to the center, we began unpacking our medical supplies and then repacking our medications into various categories. Some students worked on their projects, while others organized for our first mock clinic at the training center. We divided into the following sections for our clinic: registration, vitals, lab, triage, provider, and pharmacy. The Guatemalans oversaw registration, and the rest of us were at the other stations. Our provider is Sukhi, a physician from Illinois, who also brought her son to volunteer, Suryabir, who is studying genetics in college. We also have Sam, a high school student with us translating Spanish to English for Sukhi. The leaders of GVH who are with us are Dr. Jennifer Hoock and Carolyn. Carolyn speaks English and Spanish and is one of our primary interpreters. I have to say the mock clinic was insightful to how our team will work. 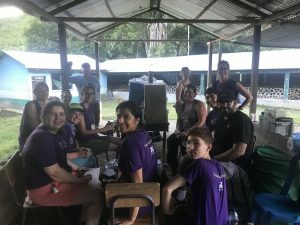 Having at least 30-40 Guatemalans show up and move through the clinic was a big task, but I felt we did very well and communication between the team members was smoother than I anticipated. However, it ran a long time, but as to be expected since this was our first time. We were able to “tryout” our Sexually Transmitted Infections survey and realized that it was too sensitive of information to bring forth by someone outside the culture. 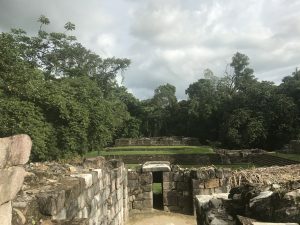 It seemed to work well if Juanita, the Guatemalan nurse or Lesbia, the health promoter asked the questions in a secluded area. So, we hope to give this a try with our subsequent clinics.